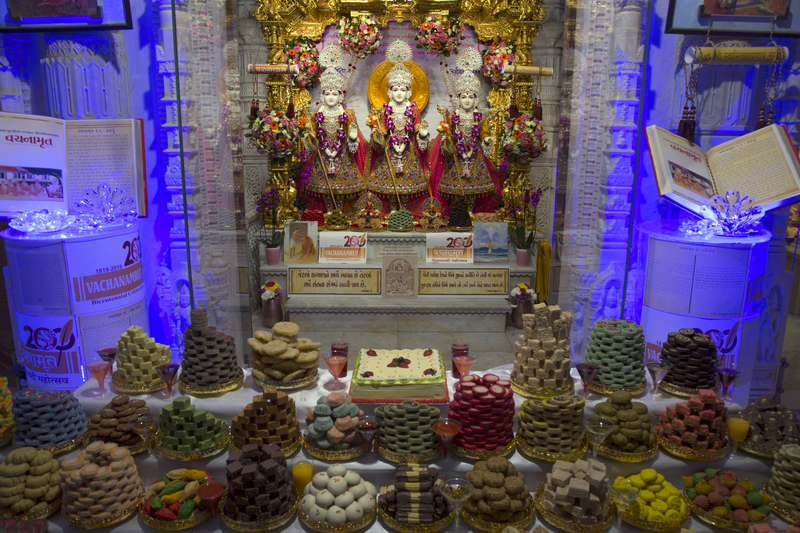 The divine manifestation of Bhagwan Swaminarayan and Bhagwan Rama was celebrated over the weekend of 13 and 14 April 2019 at the Neasden temple, London. An evening cultural programme of devotional singing, presentations and short sketches involving children, youths and elders was held at the Mandir on Saturday 13 April to mark this joyous occasion. Their performances drew upon the Bhagwan Swaminarayan’s message of faith and knowledge of God’s greatness encapsulated in the Vachanamrut – a compilation of 273 spiritual discourses delivered by Bhagwan Swaminarayan containing the profound wisdom of Hindu scriptures. This year celebrates 200 years since the first Vachanamrut was delivered. Swamis discoursed on these messages further, narrating inspiring accounts of faith from devotees amid hardships and adversity. Video blessings from His Holiness Mahant Swami Maharaj brought these concepts together before youths performed a vibrant and colourful dance in honour of the Vachanamrut to provide an uplifting conclusion to the assembly. Chaitra sud 9 is the Hindu calendrical day on which Bhagwan Swaminarayan and Bhagwan Rama manifested on earth. This year the day fell on Sunday 14 April and was marked with a host of devotional festivities at the Mandir, including a ceremonial offering of food (the ‘annakut’), singing, chanting, and an evening assembly. A special musical programme was held in the evening where youths, senior devotees and swamis sang a series of devotional songs extolling the greatness and glory of Bhagwan Swaminarayan and Bhagwan Rama. Their devotional hymns were accompanied by the melodious sounds of various musical instruments and interspersed with short commentaries. In his keynote address, Yogvivek Swami, Head Swami of the Mandir, drew upon the exemplary lives of Bhagwan Swaminarayan and Bhagwan Rama and encouraged everyone to incorporate their teachings into daily spiritual living. The evening assembly culminated with a special arti at 10.10pm, signifying the precise time Bhagwan Swaminarayan chose to be born to mother Bhaktimata in the small north Indian village of Chhapaiya. The birth of Bhagwan Rama was marked with an arti earlier in the day at noon.